You exit the elevator and walk down a corridor adorned with eerie mutating portraits, among them a ship…which transforms into a ghostly galleon on stormy seas. Of all the portraits, the ship was always my favorite, for I have long been a fan of sea-faring tales—especially those that involve ghosts. While I could say that this portrait could have been inspired by countless stories, among them Poe’s “Descent in the Maelstrom,” the first work that always popped into my mind when I saw the portrait wasn’t a short story at all—it was Samuel Taylor Coleridge’s famous poem, “The Rime of the Ancient Mariner,” which is really a pretty terrifying ghostly tale. 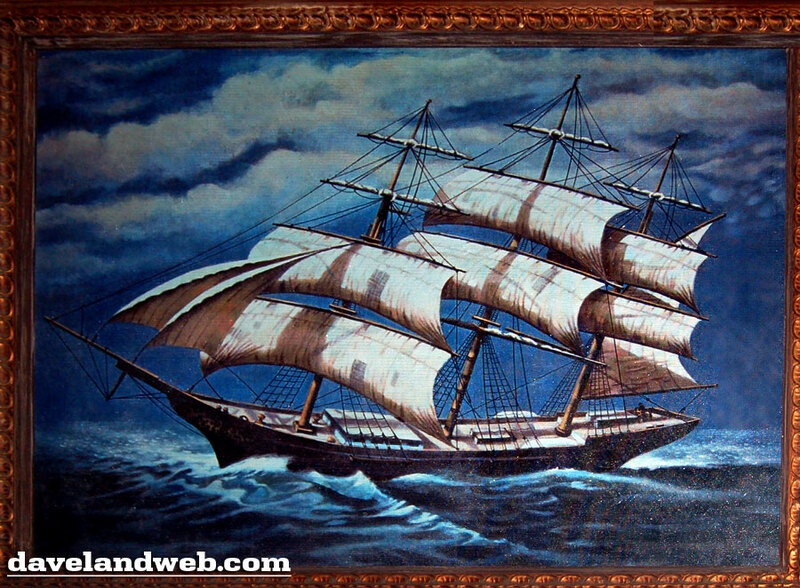 The first stage of the portrait, which depicts a ship sailing on a clear day in decent weather. The opening of the Mariner’s tale describes his voyage’s rather uneventful beginnings. The above image seems to depict the Mariner’s ship under fair skies and calm seas. 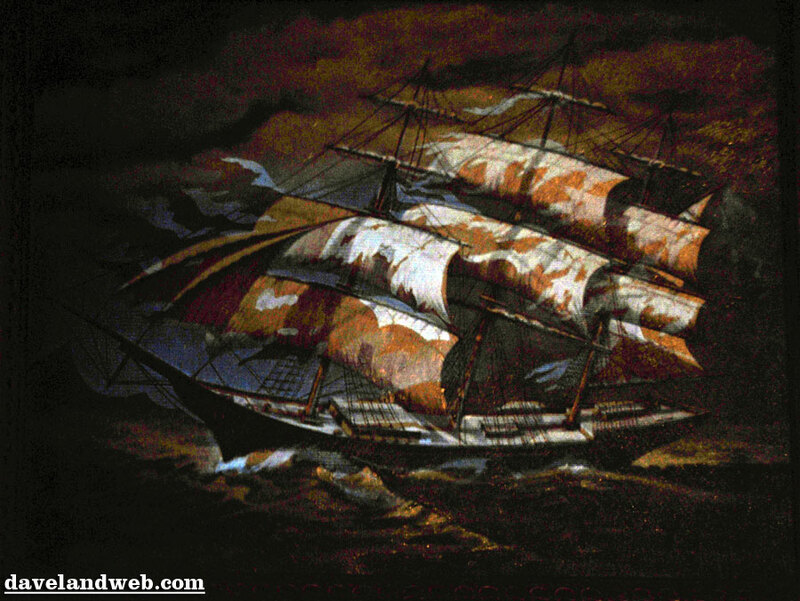 The transitional stage of the portrait, which shows a violent storm and is colored in copper—showing the next two phases of the Mariner’s terrible adventure. “And now the Storm-blast came, and he/Was tyrannous and strong;/He struck with his o’ertaking wings,/And chased us south along. The ship hits a terrible storm, and ends up in the South Pole amongst the ice. An albatross appears, however, the ice splits and loosens the ship, accompanied by a breeze. The ship is propelled into foggy waters. It’s at this point in the story the Mariner commits his crime—he shoots the Albatross, considered a sacred bird of good fortune. Thereafter, as retribution for the Mariner’s crime, the breeze stops and the ship and its crew are stranded in a terribly hot, still environment, thirsting to death. The transformational stage of the portrait—especially with the copper coloring toward the end—almost seems to illustrate this section of the tale. And horror follows…It seemeth him but the skeleton of a ship…And its ribs are seen as bars on the face of the setting Sun. Alas! (thought I, and my heart beat loud)/How fast she nears and nears!/Are those her sails that glance in the Sun,/Like restless gossameres? After the dehydrating sailors have been adrift for many days and have mouths so dry they can’t speak, they spy something on the horizon—sails of a ship. They believe, at first, that they’re saved…until it draws closer, and its skeletal appearance and tattered sails reveal that it is a spectral vessel which harbors Death itself. 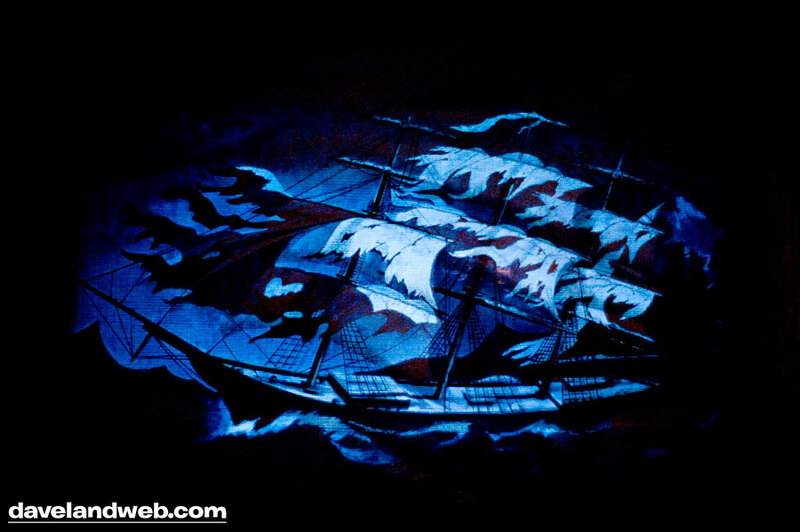 Although, in the poem, the ship appears to them at the height of another scorching afternoon in the broad daylight and theHauntedMansion’s ship is set against the stormy darkness, the ship’s condition seems to match what’s described in “Rime” (especially the gossamer sails). There is, of course, the rest of the Mariner’s tale, which is quite lengthy. But what I find interesting is that if, indeed, “Rime” served as an inspiration for this portrait, the portion of the tale at which it stops is just before the portion in which it becomes a true ghost story. The fact that it stops there—and it’s before you even board your Doombuggy to ride through the ghost story that is the Haunted Mansion—suggests that this portrait was hung with foreshadowing in mind. If you’d like to read “The Rime of the Ancient Mariner,” you can for free here: http://etext.virginia.edu/toc/modeng/public/Col2Mar.html. If you’d like to own a copy in print, you can get it here: http://amzn.com/0895986728. If you’d like it for your Kindle, it’s available here: http://amzn.com/B003F77DNM. Samuel Taylor Coleridge, “The Rime of the Ancient Mariner,” in The Rime of the Ancient Mariner and Other Poems (New York: Penguin Books, 1995), 5. (Special Note: This is one of the Penguin 60s series—small, slim volumes usually containing a short story or poem or two by one author or a couple—which were published on the occasion of Penguin’s 60th anniversary). ← DON’T MISS ME IN MIDDLETOWN, CT THIS WEEKEND!